A recent west coast road trip found us at Vancouver's venerable Nat Bailey stadium, to watch the hometown defending Northwest League champs take on last year's runner-up Boise Silverhawks on a beautiful early July evening. The Blue Jays and Vancouver first reached a player development agreement in 2011, and the results have been nothing short of spectacular. The Canadians also won the NWL title that first year, and with a mix of recent college draftees and players from extended spring training on this year's roster, are competitive again this year, just two games out of first at game time. 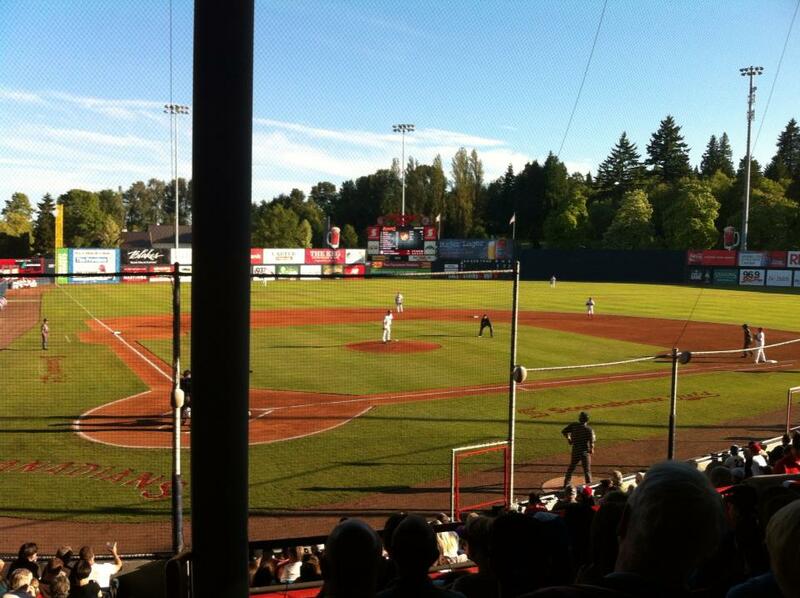 Vancouver has a lengthy minor league history, dating back almost a hundred years. The city hosted a Triple A team in the Pacific Coast league for most of the last half of the previous century. When the franchise relocated to Sacramento after the 2000 season, the NWL relocated its Southern Oregon team to the lower mainland. The Canadians were affiliated with the A's from 2001 to 2010. Locally owned since 2007, the Canadians have drawn significantly better as a Jays affiliate, attracting over 162 000 games in their first season. After 14 home dates this season, they're averaging just over 4 600 fans per game, trailing only Spokane. The C's are very popular in Vancouver - many people we encountered during our stay were thrilled to hear we were taking in a game, and most indicated that they had either recently attended a game, or were about to in the near future. With a PDC in effect until the end of the 2016 season, it's hard to see the Jays giving up on this market, where their farmhands can play in an enthusiastic environment. It helps to further grow the brand, too. The Canadians make their home at Nat Bailey, nestled up against green space in a central Vancouver neighbourhood. The Nat was originally named Capilano Stadium, and was built in 1951. It was renamed in 1978 to honour a local restaurateur who had been pivotal in bringing minor league ball back to the city. The new ownership invested heavily in renovations upon taking over the club. The stadium now hosts the Canadians and the UBC Thunderbirds, and seats over 5 000, with a kids play area down the left field line, and other family-friendly amenities that are in vogue in milb parks today. There are a few obstructed views because of several pillars which support the grandstand - we were behind one with our grandstand seats. We didn't know the seats were obstructed when we purchased them online, and while we were able to shift down a bit after the 2nd inning in order to get a clearer view of home plate, the club should indicate the view for purchasers, or discount the seats. The Nathan's famous hot dogs and selection of local craft beer helped make up for having to peer around the pillar. The evening's game featured a pair of celebrities. One was former Expo and Canadian Baseball Hall of Famer Tim Raines. Raines, who was known as the Rock, is more like a boulder now. He was in town in his role as a roving Jays minor league baserunning and outfielder coach, working with the young Canadians on the finer points of the game. Raines patiently sat under the grandstand, signing memorabilia from mostly middle-aged men until the 7th inning. Another famous name was that of Gretzky. Not Wayne, in this case, although he was in town for a game a few days later, but rather his son Trevor, who was chosen by the Cubs in the 7th round of the 2011 draft. The younger Gretzky reminded spectators that this was Class A (short season) ball by taking a bad route on Chaz Frank's leadoff double in the home half of the first, then robbing LB Dantzler of another double by making a sliding grab along the left field line two batters later. Frank repaid Gretzky the favour by getting caught stealing at third, breaking a baseball cardinal rule of not making the third out at third base (taking the bat out of NWL player of the week Jordan Leyland's hands). Starting for Boise was Edmonton native Rob Zastryzny, the Cubs' 2nd round pick last month. Zastryzny, who grew up in Texas, was making his pro debut, and was limited to only that first inning of work. His successor, James Pugliese, was touched up for four runs by the Canadians in the third, not helping his own cause by booting a routine double play ball. Frank again showed his aggressiveness on the base paths, scoring from third on a ball in the dirt that Boise catcher Cael Brockmeyer couldn't control. The ball bounced only a few feet from home, but Pugliese couldn't handle the toss from Brockmeyer, and Frank slid across with the third run of the inning. Starting on the mound for the Canadians was Matt Dermody, a 6'5" beanpole with the build that the Jays are so fond of. Dermody was drafted by the Blue Jays in the 28th round of the June draft out of the University of Iowa. The lefthander had been drafted previously by the Pirates, Rockies, and Diamondbacks. Dermody was making his first start as a pro, after a pair of long relief outings for the Canadians. Dermody was clocked around 89-90 with his fastball, reaching 92 in the 3rd. His offspeed stuff was coming in around 76-77, and he was successful in keeping the Silverhawks' hitters off balance as a result. Dermody was really only in trouble during 3rd inning, when he gave up a one-out single to Brockmeyer, followed by a double to the left field wall by Gretzky. Brockmeyer showed again his inexperience at the pro level when he attempted to score from third on a groundball to 3rd base by leadoff hitter David Bote. Canadians 3rd baseman Andy Fermin easily threw Brockmeyer out at home. Second baseman David Harris made a nice play to end the inning, quickly stepping in front of Bote to field a slow roller and throw out the batter at first. Dermody pitched 5 scoreless innings, giving up only those two hits. The Silverhawks' Pugliese was followed by a pair of relievers, who kept the Canadians off the scoreboard for the rest of the game. Lefthander Scott Silverstein relieved Dermody in the 6th, and may have been the most impressive pitcher of the night. Silverstein was the Jays' 25th round pick last month out of Virginia. Silverstein had previously made one start with Bluefield of the Appy League prior to his promotion to Vancouver. With his fastball mostly around 92, Silverstein pounded the strike zone down low, and retired the first six hitters he faced. In the 8th, he got into a bit of a jam, allowing a pair of singles around a strikeout. Bote hit a one-hopper right back to Silverstein, who promptly wheeled and threw to shortstop Dickie Thon Jr who was covering 2nd. Thon's relay to first wasn't in time to nail Bote, but for some reason, Boise shortstop Danny Lockhart, who was on 2nd when the ball was hit, didn't move on the play, even though he was forced. By the time he realized his error and bolted for 3rd, Canadians first baseman Dantzler had thrown to Fermin to nip him for the thrid out. Silverstein blanked Boise in the 9th to preserve the shutout and the win. All in all, it was a good night at the ball park.